Extraordinary first edition of Mogg's rare and important map of London, England. Mogg's map of London offers extraordinary and beautifully engraved detail throughout noting all streets, parks, and numerous important buildings. Illustrates a relatively primitive state of development on the south shore of the Thames. The downtown area consumed by the London fire of 1666 is highlighted in red. Mogg's intention in this map is to highlight various city works and urban renewal projects which were being perused in the early 19th century. We have found a few references to various later editions of this map at auction and in libraries, but this is the only first edition we know of to have appeared on the market in the last 35 years. Edward Mogg (fl. 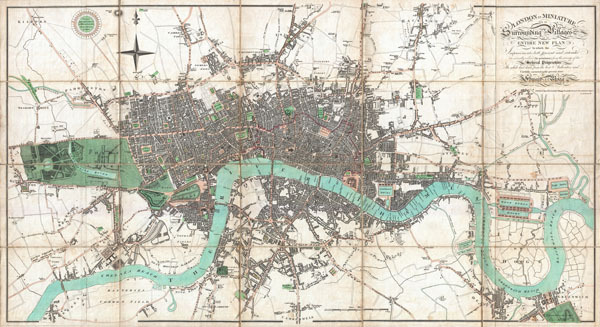 1803 - 1860) was an English cartographer and engraver active in London during the first half of the 19th century. Unlike many cartographers of the period, Mogg personally engraved all of his own maps in a fine detail oriented hand. Mogg built his business on the production of guides, railway maps, and other publications focused on tourists and travelers in London. Mogg seems to have had a passion for defending tourist against the depredations of dishonest taxi cab drivers and was the first to introduced the innovative "Cab Fare Map and Guide". Mogg also published the 1822 edition of Paterson's Roads of England and Wales and a fascinating celestial sphere for school children. Very good condition. Original linen backing. Comes with original linen slipcase. Howgego, J., Printed Maps ofLondon circa 1553 - 1850, 237-1.